Imee Ooi — I like New Age music. It gets a bad reputation when people feel like it’s taking something sacred and making it palatable to people who don’t appreciate its raw form — transforming something important into something that makes lovely white noise. But it doesn’t have to be thin. When it’s done well, New Age music can be sacred in its own rite — a merging of ancient chants or hymns with the modern science of enhancing music’s emotional impact. It can be a joining of two powers, a holy intention and a relaxing experience, rather than the watering down of just one power. But only when it’s done well! 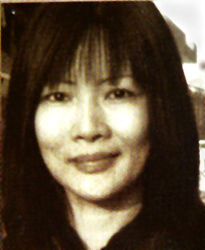 Here’s a Malaysian New Age composer, Imee Ooi, who I think does it very well: Click here. Mariem Hassan — Here’s an interesting lady. She was born and raised in the western Sahara desert — one of ten children in a nomadic family. And boy, can she sing! I love it when she does that classic Saharan call-out, with her tongue fluttering like a wing. She’s Sahawari, and has survived annexation and refugee camps, both of which she’s been very outspoken about. Women have played a strong role in her culture, and you can see that confidence and competence when she performs. 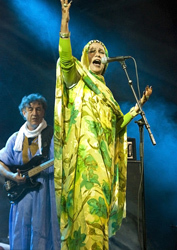 The language of her songs is Hassaniyya, an Arabic dialect. And she does write them. I’ve really never seen anything quite like her before: Click here. Capercaille — Speaking of annexations, this is a very popular Scottish folk band, singing a song about England’s treatment of Scotland. This band has been around since the 1980s, which is quite remarkable, because the popularity of Celtic sounds wouldn’t take off until a bit after that. I only have one of their albums, and this is my favorite song on it. What I like about them is not only their instrumental expertise, the singer’s likeable voice, and the fact that they are early pioneers in the genre, but also their liveliness. The fact that they’re singing about something terrible, and yet, instead of feeling weighed down by sluggish intensity, the song feels … very, very alive. It’s interesting! Click here. 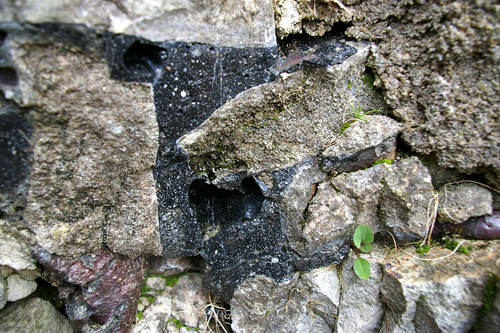 A section of vitrified rock wall. The hill fort Tap O Noth lies on a hill top in Aberdeenshire, Scotland. Along the fort is a vitrified wall, a wall heated to such an intensity, for a period of time, that it becomes like glass. Among artifacts found at the fort are a stone axe, dated to somewhere between 2,000 BC and 800 BC, as well as a bronze ring, dated to between the First and Third centuries AD. Fifty examples of vitrified forts have been found in Scotland, and their presence is a great mystery since it is unclear how or why they would have been heated to such an extent that the surface of the stone turned to glass. Robert Schoch, a geologist, after having examined some of these vitrified forts, wrote an article in New Dawn magazine. He states that temperatures of 1,000 degrees centigrade (1,832 fahrenheit) are required to vitrify rock. The forts go back to the Iron Age in Scotland, around 800 BC up to the early centuries AD. King Arthur is thought to have lived around the Fifth or Sixth Century AD. A Welsh poem written by Taliesin speaks of King Arthur and a glass castle. 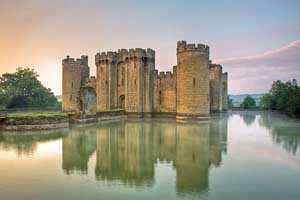 Many fairy tales have featured glass castles, a somewhat improbable concept if one is thinking of a castle as a strong fortress, but if vitrified rock is what is meant, then it becomes much more plausible. 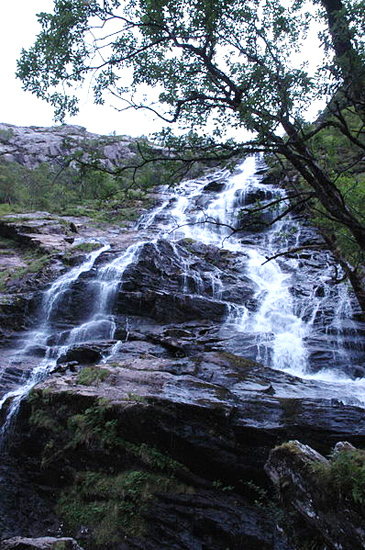 The Steall Waterfall in Glen Nevis, Scotland, in the area of one of the vitrified forts. Robert Schoch examines a number of possible theories to explain this phenomenon, discarding most of them as unlikely, then settles on a concept known as plasma events. These are occurrences of ionized gases taking the form of gigantic electrical outbursts, which can melt and vitrify rocks. He further suggests that around 9,700 BC, a major plasma event may have occurred on the earth that caused the last Ice Age to come to an end. Many recurring plasma events may have also followed the ending of the Ice Age. The sun, during solar storms, is known occasionally to throw off massive spurts of plasma. Huge plasma events might have caused the Great Flood, recorded in countless legends throughout the world. A major plasma event would have vaporized huge volumes of water that would then have fallen back to earth over a period of time after the event, causing immense flooding. The Sphinx at Giza, which Robert Schoch also examined, he believes was carved between 5,000 and 9,000 BC, and then was subject to intense rains that might also have been caused by a plasma event. He points out that plasma is everywhere, and is present throughout the universe in intergalactic space. His is quite a fascinating theory, and he suggests that the world’s megalithic monuments, which have also never been adequately explained, might have been built by early humans in an attempt to create giant structures that would withstand plasma events. Humans would have initiated the megalithic age of building right after they had witnessed the great floods and ensuing destruction caused by early plasma episodes. The Wikipedia article, Vitrified Fort, lists fourteen of the most remarkable of these sites in Scotland. They are also found in Ireland, Germany, Hungary, and in France. On a more mythological note, on the June 22, 2012 broadcast of the H2 program, Ancient Aliens, it was suggested that the Irish god Lleu, who had as his weapon a spear, had been the one who vitrified the rocks of the old Scottish forts by using this magic weapon. During an attempted assassination, Lleu turns into an eagle and flies away. He is also said to have enchanted trees. Whether it was the god Lleu or plasma unleashed by the sun (or whether the two are perhaps the same), the vitrified hill forts of Scotland are a testimony that something quite beyond the ordinary happened to cause the stone to turn to glass, perhaps a very long time ago. There is so much to history that we simply do not know, and so many indications that our entire worldview needs a good relook. Top photo: Author: jp.morteveille / Public Domain / Wikimedia Commons / Vitrified wall at Ste-Suzanne (Mayenne) in Scotland. Second photo: Author: Toby Thurston / Public Domain / Wikimedia Commons / “A view looking up the Steall Waterfall in Glen Nevis, Scotland.” Near one of the vitrified forts. To read Robert Schoch’s article, Glass Castles and Fire from the Sky, A New Theory of Ancient Vitrification, published in New Dawn magazine, click here. To read the Wikipedia article, Vitrified Fort, click here. For more on the H2 series Ancient Aliens, click here. Graham Hancock, in Part Four of his fascinating book, Underworld, describes at length, the temples of Malta and alleges that measures were taken by some not-too-ethical archaeologists to cover up the true history of Malta, which appears to go much farther back than is acknowledged. Hancock’s section on Malta is very complex, as the early history of Malta itself is remarkably complex, and little understood. So here are just a couple of highlights, not meant to be a comprehensive account. If only these old temples could speak! But they do not, and no written language appears anywhere in them. No inscriptions tell their tale. A recent program on the H2 Channel showed, among other ancient sites, some of the temples of Malta. These predate the pyramids and are among the oldest stone-built monuments in the world. In the H2 Channel’s TV program, scenes of the Hypogeum of Hal Saflieni, in Paolo, Malta show three levels of extraordinary rooms with curved architectural features. Built during the Saflieni phase (3300–3000 BC), the structures are beehive-shaped. The word “hypogeum” means “underground.” The topmost First Level is thirty feet below street level. The Second Level down has a number of significant rooms. The Main Chamber is a rock-cut circle. 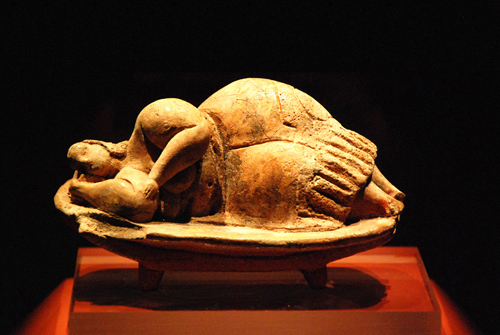 Statues of the “sleeping lady” were found here, and were moved to the Museum of Archaeology, in Valletta. Some are tiny figures. One, reclining, is just a few inches in length. Among the rooms on the Second Level of the Hypogeum are the Oracle Room and the Decorated Room. A small room, off to one side, the Oracle Room, has the amazing characteristic of producing an extraordinary acoustic effect. It amplifies any sound that is made. The room rings with sound. To me, hearing about this quality of resonant sound was reminiscent of a very old Jain temple in Tamil Nadu, India, at Sittanavassal, where one of the guides demonstrated that when he did yogic breathing without any sound, a round indentation in the ceiling of the temple produced a loud, very audible echo. Similarly, in one of the tombs in Egypt, at Sakkara, there is a small rectangular room, where sound echoes and is magnified in a mysterious way. The room is carved out of solid rock. Ancient civilizations seem to have had a knowledge of the power of sound that has since been lost to us. The Decorated Room in the Hypogeum has curved walls that shape inward, with decorations of a geometrical pattern. Early in the Twentieth Century, it was reported that the Hypogeum was the resting place of at least 7,000 human skeletons. One report said the number was 33,000. But even if one sticks with the more conservative number of 7,000, it was an extraordinary archeological find. Sadly, all these skeletons have vanished. Only six skulls remain, which were shown to Graham Hancock when he asked to see them. Their appearance was enigmatic; they were very elongated human skulls. In one of them the central seam, the Fossa Median, which exists in all adult humans where the two halves of the skull come together, was, inexplicably, absent. Apart from the strangeness of the skulls, it is sad, but perhaps not really strange, that the other 7,000 skeletons are no more to be found. This kind of destruction and disappearance is not without precedent in early archeology. It would be hard to top the destruction wrought, for example, in Egypt, by some of the “archeologists” brought along by Napoleon. There have always been conscientious archeologists, and also those who were simply treasure-hunters or who had other agendas. On the other hand, according to another source, the skeletons had already severely deteriorated from dampness, so perhaps they simply could not be preserved. 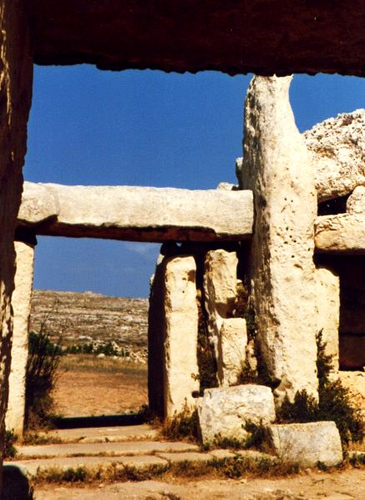 Several old temple complexes grace the islands of Malta; all are extremely ancient megalithic structures. 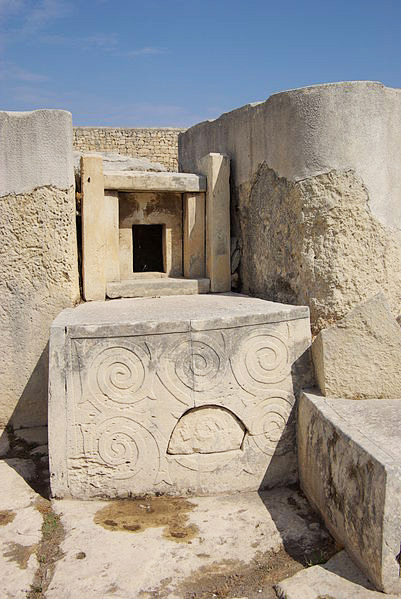 The primary phases of temple construction in Malta are the Ġgantija phase (3600–3200 BC), the Saflieni phase (3300–3000 BC), and the Tarxien phase: (3150–2500 BC). A Wikipedia article describes the Mnajdra Temple Complex, made of hard coralline limestone. It is on the southern coast of Malta’s southern island. Limestone is a sedimentary rock, composed usually of the skeletal remains of coral and other sea creatures, which built up at the bottom of the sea over time. 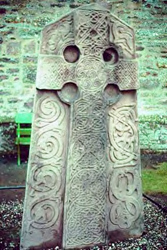 Post and lintel construction was used, with a large heavy crosspiece, called the lintel, set across two large stone posts. Unlike the Hypogeum, where the temple levels are underground, the temples at Mnajdra, are all above ground, built on a hillside. So the topmost one is not the most recent. In fact, the topmost temple of the Mnajdra complex is the oldest, and it is estimated that it may go back to 3600 BC (to the time of the Ġgantija phase). The pillars of the trefoil temple were decorated with pitmarks. There is a triple entranceway. The second temple, the most recent structure, is the youngest and goes back to between 3150 and 2500 BC (the Tarxien phase). The third temple, the lowest, also constructed in what is known as the early Tarxien phase, represents the height of the culture of temple building in Malta. The three temples of Mnajdra overlook a steep hillside running down to the sea on the southern coast of Malta. The third temple has an astrological alignment, and at the summer solstice, the sun’s first rays light up one of the decorated megaliths, with the stone opposite being lit at the winder solstice. At the equinox, the sunlight shines through the main doorway to illuminate an inner niche. Alignment with the stars and building with giant stones recur everywhere where megalithic structures are found the world over. Sometimes the gods, goddesses, the animal figures, and the geometric patterns and symbols reappear also again and again. 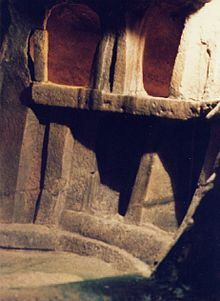 In the Malta temples, it is the goddess form that is repeated, often as a small carved figure, depicted standing or lying. As to the age of the goddess and the temples, Graham Hancock questions, in a rather amusing conversation, the means by which the dates of the Malta Temples have been estimated, when he asks an expert where the samples came from that were used in carbon dating. The samples tested apparently came only from the soil on top of the floor of the temple and never from underneath it. The ruins of the temples had been used over thousands of years by local people, including in many cases by goatherds and shepherds, as shelters for their flocks, so one can only imagine that the dating from the debris on top of the temple floors would hardly indicate the true age of the temples. Who was this ancient goddess of ample proportions whose name we do not know? Whoever she was, is it not likely that she was the same being as the stone age goddess, carved again and again, in what are known as the “Venus figurines,” whose form is found throughout the Paleolithic sites of Europe, going back as far as 35,000 years, up to about 11,000 years ago? Places of many mysteries, the Malta temples, must speak now only in dreams or in fleeting glimpses of insight, like the rays of the summer solstice, here for a moment and then gone. Top photo: Author: Berthold Werner /“This is a copy, the original is in the National Museum of Archaeologie in Valetta.” / GNU Free Documentation License, Version 1.2 / Wikimedia Commons / Malta, Tarxien temples, altar. Sometime around 1968, in the south of France, I remember looking up a hill as someone pointed out to me the remains of a Roman aqueduct, still there after 2,000 years – a high wall with arched openings and a stone channel on the top where water used to run. The Roman system of aqueducts carried water for irrigation and drinking across much of Europe, just as the Roman roads created a transportation web. Many modern expressways in Europe follow these same ancient paved highways, built by the Roman legionnaires. What is not so well known is that the Romans did not themselves invent either aqueducts or the system of paved roads. It was actually the genius of the Etruscans that developed these and a number of other technical wonders. Etruscans had a high degree of technical knowledge. They developed the intricacies of water and sewage management, plumbing, irrigation, and architectural designs. Big bridges were originally built by Etruscans. The Romans were warlike – Latian, native people from the region of Latia, and, as we know, they eventually conquered northern Italy, and the rest of the Roman Empire. 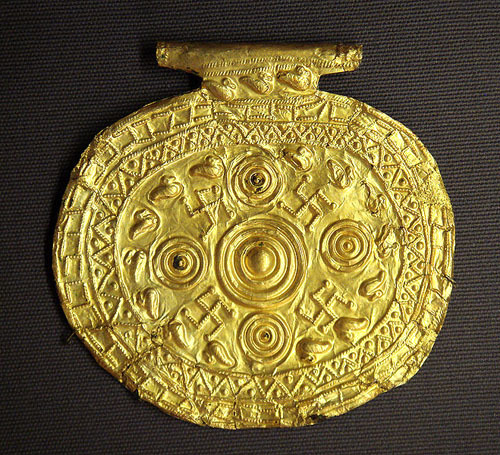 The Etruscans had great riches, including stone carvings and paintings, and they were fond of jewelry. Around 10,000 samples of their written language have been found on tablets. It is a script still not deciphered, though it is known to be non-Indo-European. The Indo-European language group which extends from the east in India, all the way across Europe, first swept through Europe around 8,500 years ago, leaving untouched a swath of northern Italy, where later on, in Tuscany, the Etruscan language emerged – and another swath in the mountains of northern Spain, where the Basque language grew into being. Etruscan died out long ago, but Basque is still a living language. It is thought that Etruscan and Basque may be remnants of an older, earlier European language group, predating the Indo-European group. Also outside the Indo-European language group are around three dozen other European languages known as the Uralic languages, including Estonian and Finnish. The alphabet of the Etruscan language evolved from an alphabet in use by the Greeks, and before that, it was used by the Phoenicians. From the Etruscans, it was borrowed by the Romans and became the “Roman” alphabet that we know today, used in English and most European languages. So, we have the Etruscans to thank for the letters we are reading. Most authorities believe the Etruscans came by sea from West Turkey, North Africa, or Crete. They came from an advanced civilization, but their origin is not known for sure. Like the Etruscans, the Minoans on Crete knew how to melt iron ore and make tools – but not weapons. Etruscan artisans made hinges, doors, locks, keys, and utensils for daily life – carved with dancers and animals. Much of their artwork is found in gravesites, depicting men and women dancing and eating at banquets together. They seem to depict social equality since the seating at banquets is equal for men and women. 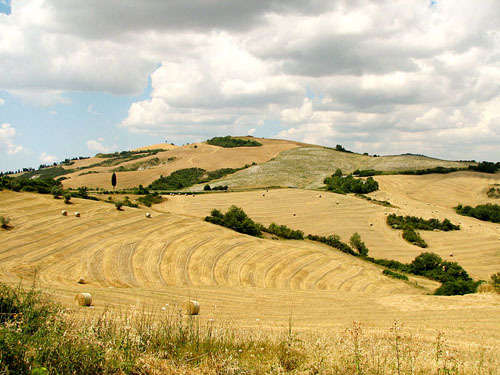 A friend of mine, who we’ll call Abbie, since she prefers to remain anonymous, in 2002 went to Tuscany in the north of Italy and to Umbria which lies beyond Tuscany to the northeast. She returned once a year for four or five successive years, visiting numerous fields and archeological sites. She recalls that sometimes churches were built on what had once been sacred sites; sometimes there was a spring there. Nearly every town in these provinces has a museum with Etruscan artifacts. Near Florence, going down some stairs into an underground room, where the ceilings were around five and a half feet high, Abbie found herself in a burial chamber. The people when they died had been buried in sarcophagi, carved with scenes from their lives. After that, she visited many other tombs, outside Siena, and near Lucca and other towns in Tuscany. 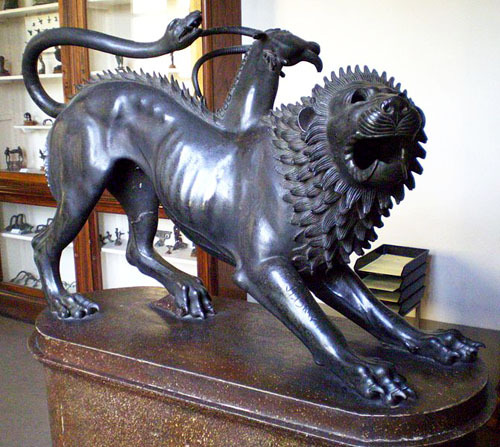 The Etruscans founded the city of Lucca, which in 180 BC became a colony of Rome. Siena too was built on top of an Etruscan settlement. The Etruscans inhabited twelve regions or city-states. Apparently they did not have a single capital city; their governance was through a council of representatives. As with gravesites all over the world, there was a lot of looting over the years. During one period, they cremated their dead, placing the ashes in smaller sarcophagi. Much of their lives was spent preparing for the after-life, and going by their paintings on the tomb walls, they must have envisioned the after-life as a joyous time, when they would be happy. The underground tombs were square rooms, with stone benches along the side, originally lined with grave goods, such as jewelry, drinking vessels, and tools. On the walls were painted friezes of very colorful, vibrant scenes, of banquets, dancing, and musicians. Down-to-earth people, they enjoyed hands-on work like metal-working. They seem settled and contended with their lives. The underground gravesites often opened out into several rooms. There were no scenes of war or conflict, so they must have been a peaceful people until they were attacked by the advancing Romans. Tarquinia, the Etruscan Tarchnal, was among the twelve Etruscan cities. In the sixth century, BC, the Tarquinians fought against the Romans, and though they are said to have fought well, the Romans won that battle. The wars for supremacy lasted over several centuries, and by 181 BC Tarquinia had become a municipality of the Roman Empire. The Etruscans had lost their independence. 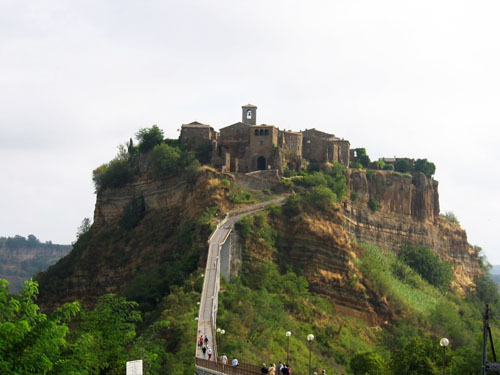 The original site of the city of Tarquinia lies to the north of the current town on a plateau. The two towns co-existed through the Middle Ages, with the older town dwindling in size, and the newer town thriving and becoming a major city. In the old site of Tarquinia are cemeteries from the even older Etruscan times, consisting of many round buildings, with round roofs; the buildings being connected by passageways. They are large, with diameters of maybe 50 to 70 feet. 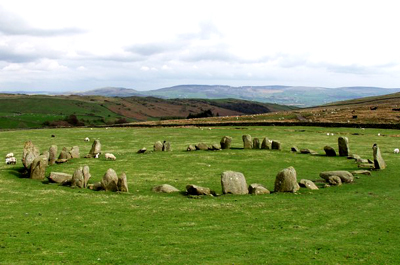 Used as gravesites, they are all built of beautiful, precisely cut and shaped stones, perfectly fitted together. Seen from the outside the stones are gray. Inside, the brightly-painted walls were once lined with grave goods. When the Romans took over Etruscans lands and cities in the later centuries BC, they learned metalwork and weaponry from the people they had conquered. As is generally the case for people whose lands are invaded, many of the people were killed, but not all, and for a few hundred years, they co-existed, while Latin gradually replaced the Etruscan language. The Romans also picked up many practical inventions like waterworks. At Rosella, a site about an hour north of Rome, can be found the remains of an Etruscan settlement, where people lived in rectangular houses, with the individual houses all joined together, along narrow streets. There were no strong defenses, so the Romans had no difficulty in overrunning them. 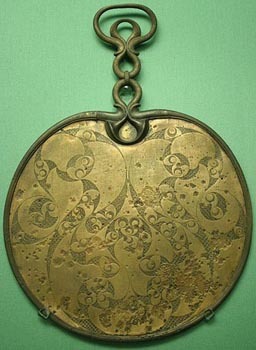 Artists and craftspeople, their social system was egalitarian, and their form of governance was a council system. They were Bronze Age people, with their civilization extending from around 1200 to perhaps 100 BC. In museum exhibits, can be found lots of sarcophagi with beautiful, very endearing carvings of people on the lid, men and women, sometimes with dogs. Their faces are realistically done, with some young and some old – “faces one can connect with,” as Abbie puts it. Who were the Etruscans? To this day no one really knows. The two most accepted theories are either that they grew into a civilization exactly were they were – in the Tuscany region of northern Italy – or that they came from Asia Minor, perhaps from ancient Lydia. Some feel that they may be the ancient Sea Peoples, the Hyksos, who invaded Egypt round the thirteenth century BC. The Greeks called them Tyrrhenian pirates, and the sea to the west of Italy is known as the Tyrrhenian Sea. Herodotus says the founder of their civilization was the son, Tyrrhenus, of a Lydian king. Could there be a connection with Tyre, in Lebanon, once a Phoenician city? We do not know. Only that they seem an engaging, lively people, inventive, creative, and peaceful. Isis – Long ago in Egypt, the mother of all nature and magic was Isis. 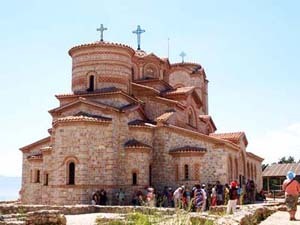 Her religion spread all the way to Greece and beyond. Compassionate and devoted to her family, she was frequently depicted with her son on her knee. Her most famous story involves putting her husband back together after he’s been torn to pieces by an enemy. There was sometimes both a sensual side to her worship (because of her role as a wife and partner) and an entreating side to her worship (because of her gentleness and compassion as a mother.) She had by far the strongest magical powers of all of the Egyptian deities, and was summoned the most often in people’s magic spells. 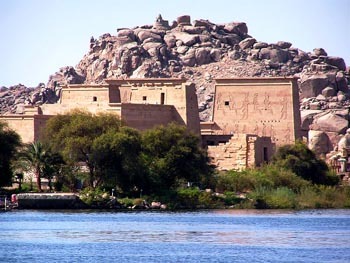 Her temples from Egypt to Italy to Iraq continued to be places of worship well into the first several centuries AD. But in the end, decrees were put out to destroy them all, and a huge number of them met that fate. Here’s a portion of “The Song of Isis” by the incomparable David Heath. Click here. Brigid – She’s been both a Celtic goddess and an Irish Catholic saint. The goddess named Brigid was a goddess of poetry, and a keeper of all things “high” (from high thoughts to high flames to high mountains.) When Celtic lands were converted to Catholicism, a Saint Brigid emerged who is thought by many to be a new version of the Goddess, Brigid. High priestesses tending sacred flames was a long-standing Celtic tradition. And today, Saint Brigid is often honored by the keeping of never-extinguished flames. In one spot in Ireland, nuns tend the flames of St. Brigid full-time. Here is a song to Brigid (pronounced “Breed” in Gaelic) by Beverly Frederick: Click here. Kwan Yin – She’s either a Chinese goddess or a Buddhist boddhisatva or a Taoist Immortal, depending on your religious beliefs. 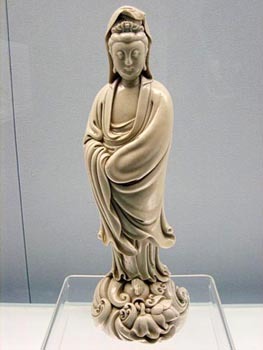 No matter which she is, Kwan Yin (or Guanyin) represents compassion. She’s the one who “hears the cries of the world.” She feels for us all and has mercy. Her legend began in China, but today, she is also popular throughout East Asia. Because of her deep kindness, she is often associated with vegetarianism, and some think that she particularly looks after women and children. Here’s a nice song about her by the silky-voiced Lisa Thiel. Click here. Yim Sang — I think Cambodia has an interesting history. Once upon a time, it boasted the largest urban center in the world. Angkor was the envy of the lands for a long time. Hinduism thrived, then later Mahayana Buddhism, and the society was apparently relatively prosperous, comfortable, and I even see hints a great deal of respect for both genders. They had ups and downs, including some wars and a Dark Age, and a little period of being owned by the French. But in many ways, including musically, they really continued to thrive. They switched to Theravada Buddhism, they continued along. And then in the 1970s, the absolutely unimaginable happened. The Khmer Rouge rose up from within and killed …. Everyone. Anyone who wore eyeglasses (because they looked smart) … anyone who sang a song … anyone who danced …. Anyone who prayed … anyone Chinese or Vietnamese … anyone who wasn’t marching fast enough …. anyone. Torture became commonplace. The once mighty and prosperous Cambodia was reduced to … something unthinkable. They’re recovering – but can you ever recover completely from something like that? It’s no wonder that today, there’s a movement to “Save Khmer (Cambodian) music.” The Khmer Rouge did everything they could to wipe it out! But the Cambodian Living Arts is working hard to try to revive the artistic world of Cambodia, and to teach people how to sing and dance again. They post a lot of videos on YouTube, so let’s help them get authentic Khmer music out there again, for people to see. Here’s a look at one they’ve put up of a grand master of Cambodian woodwind instruments, Yim Sang, now 85 years old, who somehow survived it all. Click here. And no Bob Marley fan would forgive me if I didn’t also post a link to him singing No Woman No Cry, now that he’s on their minds. Here you go! Anonymous 4 – Choral music has been a European tradition since Ancient Greece. It’s singers singing a song in unison, often in many different vocal ranges simultaneously. It can be all men singing, or all women, or most commonly, a mix of men and women in order to get the full effect of high voices and low voices singing the same song at the same time. Choral music flourished a lot during Medieval times and the Renaissance, and the female chorus, Anonymous 4 is dedicated mainly to choral music of the Medieval era. (Though they do pay homage to choral music throughout time.) Most people I know who love music own at least one album by these ladies. Their music is widely regarded as a staple in any respectable music collection! And they really do bring an older, slightly more nervous, but also more haunted age in history to life with every song. Click here. 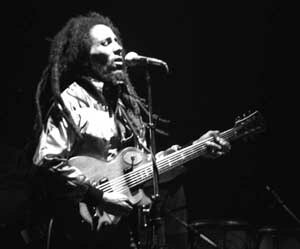 Second photo: Wikimedia Commons / Ueli Frey / http//www.drjazz.ch/album/bobmarley.html / This file is licensed under the Creative Commons Attribution-Share Alike 3.0 Unported license. Did you know that sub-atomic particles can communicate with each other instantaneously over a distance? If you think about it, this is kind of amazing. All this is interesting because of the implications of the theory. A number of actual physical experiments have been conducted, the Bell test experiments, which scientifically proved this. Sub-atomic particles have a spin – either clockwise or counterclockwise – and this can be measured. When two particles are “entangled” or connected, one will have a spin opposite to that of the other. When the spin of the first one is changed, say from clockwise to counterclockwise, then the spin of the other will automatically reverse as well. Now the really weird thing is that this happens even when they are not near each other. It happens across distances. In the experiments that have been done, in which the spin of Particle A is changed from one direction to the opposite – the spin of Particle B, which has been moved to several kilometers away, then changes automatically, by itself, at the exact same moment in time – even though there is no possible line of communication between the two. Somehow information has passed instantaneously, faster than the speed of light, from one particle to the other. To actually understand this properly and be convinced, you’ll need to read an explanation from an authoritative source, which is not me – so I would suggest you look it up online – or read any of many books on quantum physics or watch any of several TV programs. In any case, it is an accepted scientific observation in the real world. These experiments are intriguing – and what seems most intriguing, though this is a leap from the scientific world of measurement to the philosophical world of speculation is that it would seem that the only way to explain this is to say that space and time do not have any absolute existence – indeed that the entire physical universe is not really real in quite the way we have always imagined it to be. This is generally accepted by physicists as true too, since the last time the physical world seemed to actually correspond to the “common sense” way of perceiving it was in the days of Isaac Newton (although even Isaac Newton had his own peculiarities, being obsessed with topics like prophecy and alchemy, but that’s another story). Anyway, this lack of substantiality of the physical world cannot help but remind one of some of the concepts of ancient Hindu thought that evolved hundreds or thousands of years ago – like the concept of Maya – sometimes translated as “illusion,” but it certainly seems that the concept of Maya is much more complex than that. It is associated with ideas of “magic” and “power” and the bringing into existence of a field of limitations which cause one to see only the physical reality that we live in every day – and to mistake this for the ultimate reality, which we are generally blind to – except in flashes of great, clarifying insight. The example used often is that of a rope. In the darkness, a rope lying on the ground can be mistaken for a snake, which can be a great cause of fear. But when daylight shines, it is seen clearly to be just a rope. There are higher levels of reality, and we have glimpses of these – intuitions, inspirations, visions, and dreams – moments of clarity and insight, which come to us from a higher source or a higher world, where the things that are are not at all separate, distinct, and isolated – but where reality is much more fluid, where there are millions of unseen connections, not explainable by the simple laws physics as we think we understand them. This awareness leads to a perception of art, myth, spiritual traditions, history and prehistory, as having a more profound, more pervasive reality than we might have thought – where “truth” is of a higher level – where we are not isolated individual beings – but instead are all interconnected – where, for example, the environment and the human are not in opposition, but are one – where, ultimately, the trees, the stars, the clouds, the butterflies, the rabbits, and the tigers are not separate from us. We are they, and they are us. 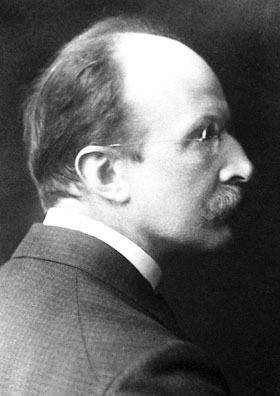 In the end, scientific and mathematical theory and also the knowledge passed down in the most ancient writings point the way in the same direction – that there is a mystical, spiritual reality – that there are levels infinitely more real — clearer, brighter, and more luminous than the foggy world shown to us through the cultural lens of our current world civilization. 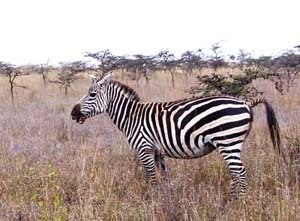 Top photo: Wikimedia Commons. 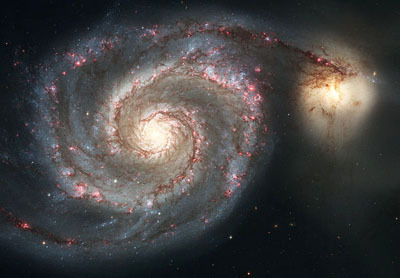 “This file is in the public domain because it was created by NASA and ESA.” / (Spiral Galaxy M51, NGC 5194) is a classic spiral galaxy located in the Canes Venatici constellation. 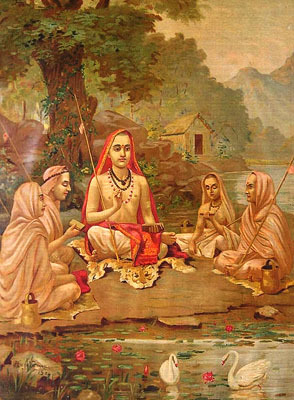 Second photo: / Wikimedia Commons / “This work is in the public domain in the United States, and those countries with a copyright term of life of the author plus 100 years or fewer.” / Photo of a 1904 painting by Raja Ravi Varma. Esma Redzopova – The Roma people (sometimes called gypsies) have been some of the most persecuted people in the world. I’m sure I’ll get my history a little bit wrong here. But more or less, it’s thought that they may originally have come from India during the Middle Ages (No one’s sure why.) Then they landed in Eastern Europe (which is where the majority still live.) And to a large extent, they became a slave population there. Only in the 1800s was all slavery of Roma abolished. Many fled to other parts of Europe over the centuries, but they weren’t usually welcomed. Back then, the Roma preferred a nomadic lifestyle, and didn’t want to settle down and farm as some well-meaning neighbors tried to get them to do. Plus, they dressed a little differently, they sometimes married younger than what was considered acceptable, they had some customs and beliefs that Europeans found “superstitious”, and of course, they were poor, all of which made them a little unpopular. The poverty in particular caused a small number of them to do what many of us might do when we’re extremely poor. And it wasn’t long before the Roma gained a broad, generalized and therefore unfair reputation as thieves and beggars and particularly tricksters. So they continued to be persecuted. The Nazis tried to wipe them out completely in concentration camps, Czechoslovakia tried to sterilize their women, Spain took many of their children away. But through it all, somehow, their colorful culture and strong extended-family values survived. And Roma music kept on playing, influencing sounds throughout the continent, and eventually, all over the world. Possibly the most famous Roma singer of all time is Esma Redzopova, who lives in Macedonia, a place she declares treats its Roma population wonderfully, and she is currently a member of her local government! She’s been singing since she was a child, and has been a foster mother literally to dozens of orphaned children. Click here. Pandith Amaradeva – There’s a very strong music scene in Sri Lanka. It’s been heavily influenced by a lot of things over the centuries – Buddhism was one of the earliest and most major musical influences. The arrival of westerners brought some particular instruments, and of course, India and its films played a role. 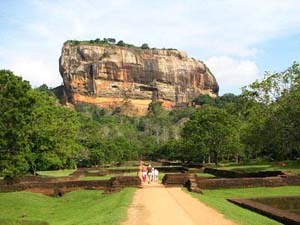 But all in all, Sri Lanka has a sound that’s all its own, and it has many fans. One name you have to know in Sri Lankan music is Pandith Amaradeva. Once people started making records, he’s one of the people who shaped the distinctive Sri Lankan sound that would be heard by the world. And he has the most velvety voice. Some Sri Lankans living abroad say they can’t hear him without feeling transported home: Click here. Kalamashaka – I’m one of the only music fanatics I know who likes rap. Rap is music with the melody stripped out of it. It’s just voice and rhythm. It’s spoken word infused with rhyme, exaggerated emotion and a beat. People use it to communicate with power. To put force behind their words and to be heard. It gets a bad reputation sometimes because it speaks from and to the fire core of the personality. The words are wrenched from a visceral place. And so sometimes, other things that were locked in that Pandora’s Box come out – fantasies of violence, rage, misogyny, and destruction. None of that is a necessary part of rap. But it happens sometimes because rap explores the dark side of music – the side that isn’t pretty, but powerful. Rap really is proof of the raw force of music – the undeniable energy that all music taps into – even if you prefer something a little more comforting! Kalamashaka was one of the first really high quality rap groups to come out of Kenya. (In the world of rap, you’re considered high quality if you speak about rage, politics or social problems. You’re taken less seriously if your music is easy to dance to because that means your music is too “pretty” and not visceral enough.) Kalamashaka is a very well-respected socially conscious rap group from Nairobi, and is credited with helping make Swahili-rap a worldwide phenomenon. Kenya is now becoming a leader in the world of rap, and this is one of the songs that started it all: Click here. Lady Isadora — Before Christianity swept across Europe, Europeans had a different religion. It varied tremendously from region to region, and even village to village, but generally, it was polytheistic, involved seasonal celebrations, and magical practices. Christianity was a new, beautiful and light-filled religion, but its followers didn’t behave well during the sweep across Europe. People who wanted to hold onto their current religion were put to death. Under the Inquisition, even people who were suspected of remaining loyal to the old religions were put to death. But the old religions were subtly absorbed and remembered in both Europe and in countries where Europeans later moved (Australia, United States, Canada etc.) The Irish Goddess Brigid became the Christian Saint Brigid. The Winter Solstice holiday became Christmas. Samhain became Halloween. Beltaine became Easter. And gradually, as religious tolerance has become an important value of western culture (Not fully realized, but definitely idealized) a small number of people out there returned to Europe’s older religious roots. This return shows up in music, as well. This is Lady Isadora, a pioneer in the genre of early European religious music. I’m sorry I can’t find a video of her performing live. This one has just a stationary photo with her song: Click here. Claudia Gomez – This singer always makes me feel like I’m in Colombia. And it’s a country I’ve never been to! But it’s just the atmosphere of her music. 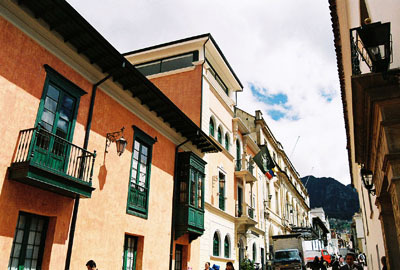 I can smell it, I can taste it; I’m sure I’m there, growing up with her in urban Medellin. She does sophisticated, original arrangements, based on the traditional sounds and folklore of her nation. Listening to her on the radio just transports you to a rainy street, full of children and the smells of cooking. Her music has such a smooth sound, that it’s easy to underestimate the creativity that goes into it. But the sounds are very complex. Apparently, she grew up in a very musical family because here she is singing with her mother; click here. 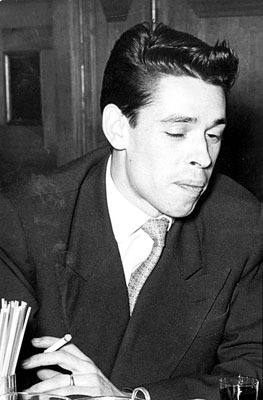 Jacques Brel – He was a Belgian who lived in both Belgium and France. He smoked four packs a day, rarely slept, and had something of an addiction to meeting new women. (Sadly, he died very young from that lifestyle.) But what I really like about him is that his songs (which he writes himself) have a common theme of being so very disappointed about life. There’s almost an anger in him when he sings, an unbearable frustration that life and the world are just not what he had hoped they were going to be. Not what he believed they could be. As though he just can’t wait to get out of here. I see him as an awkward man, not as handsome as he may wish, uncomfortable in front of crowds, yet he has something he wants to say to them. Stories he wants to tell. He really is an acquired taste, because the French music scene at the time (1950s and early 1960s) had a real cabaret feel that looks outdated to us now. But his songs can stand up to a very close listening, and the more you hear, the more you may appreciate this quirky artist. Click here. 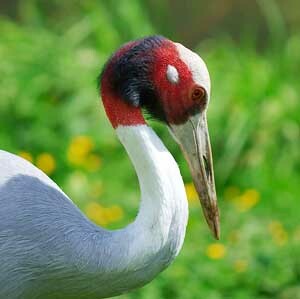 I just watched the program Nature, on PBS, about the environment around Chernobyl 25 years after the nuclear accident. It featured two Russian scientists, one of whom has spent his life studying wolves. Following the Chernobyl accident, the forest in the immediate area turned red. Now it is green again. They observed the wolf packs and the young cubs. They also watched the doormice. They found that 4 to 6 percent of the doormice had abnormalities, presumably caused by radiation. The rest of the dormice population was healthy, normal, and thriving. The two scientists did not remain in the area for long at a time because of the radiation danger, and no humans live there. In two weeks of observation, they located 17 wolf packs and around 120 individual wolves. The one wolf expert had an extraordinary ability to call the wolves by howling. Wolves appeared out of the trees, howling as well. White-tailed eagles, ravens, songbirds, and the carp in the river seemed well and healthy. They spotted a large boar. The beaver were not doing too well since they are prey to the wolves. The scenery and the beautiful winter light on the trees and the rivers gave the impression of a magical world. The conclusion the scientists drew was that the population of wolves and the habitat in general was exactly the same, no better and no worse than other natural, undisturbed wilderness areas. This is an area where humans cannot go because of the high levels of radiation. It is interesting to recall that, as humans, we are the weakest of the earth’s creatures, having lost much of our original physical strength over the course of the centuries while we have removed ourselves further and further from the natural world, and as we make a habit of living in artificial environments. Other primates for example, even the small ones, are much stronger than we are. We are no longer well adapted to living in nature. This study, done by the two Russian scientists, seemed, in its own way, remarkably hopeful and uplifting, for the future of animals and the earth.